Columbus sailed southwest from Guanahaní to search for Japan and gold. 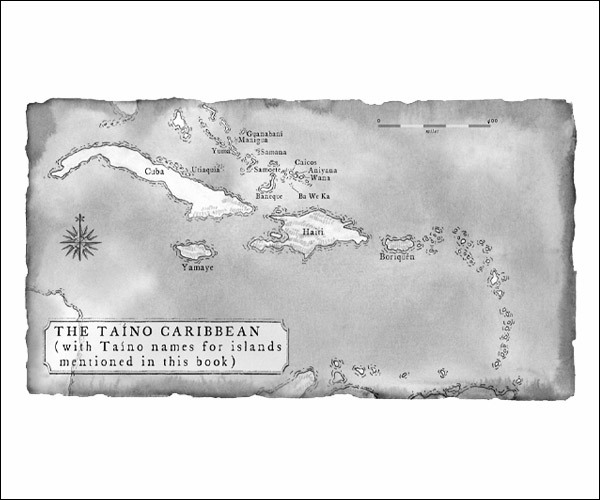 The map below—drawn for Encounters Unforeseen—shows the Taíno Caribbean which Columbus would explore, with Taíno names for islands. Before departing Guanahaní, Columbus abducted seven Guanahanían youths to serve as guides and to learn to become interpreters. Portuguese explorers had used this practice in their African explorations. Unknown to the Guanahaníans, three or four of them would be taken to Spain in 1493.